Here's a friendly reminder to request a M R Gardens plant list by contacting me at gardens@wncmretc.com or 828.333.4151. 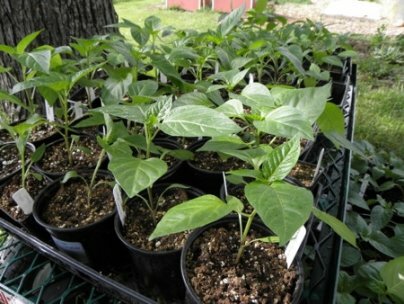 I'm offering starts for spring and summer vegetables, culinary herbs and beneficial flowers. Spring seedling orders are due this Saturday, March 1 and summer transplant orders are due March 15. Plan on receiving your spring plants by April 1 and your summer plants by May 10. There are lots of benefits to ordering your plants ahead of the season. Namely you receive the strongest, best-looking plants at the nursery. At M R Gardens, special attention is given to each of the seedlings, which are grown in organic potting soils in the healthiest environment possible. You can arrange a time to pick up your plants that fits well with your schedule and with the increasingly unpredictable last frost date. While you're at the Gardens, you can take a quick tour to get ideas for your own garden. Your plants are well nurtured, remaining out of inclement weather, until they are safely in your car. Once they arrive to their new garden home, you know you have space for them because you did the planning your plants deserve. For the past five years, I've been creating gardens at my home site in part to serve as a demonstration area for M R Gardens customers—a place for you to get ideas, learn new techniques and work with an experienced grower. My hope is that as you participate in the establishment of the Gardens, you'll feel like a piece of this place is yours. Often times, the best way to learn about gardening is by doing. The memories of our actions are embedded in our bodies so that undertaking these tasks later on becomes easy. With my "Work for Produce, Plants or Education" program, you can gain new skills, try out something new that you're curious about, or just enjoy the physical activity in the outdoors. As we work together, tidbits of information seep into conversation that you otherwise might not think to ask me. You can gain from my unique approach to gardening that I've developed throughout my interesting educational path. Permaculture heavily influenced me at an early stage in my training, and the philosophy stuck with me as I researched and experimented with various scales of sustainable agriculture, learned from diversified farmers, gained a foundation in horticulture and landscaping from the local community college, and perfected my own style of no-till gardening that combines the methods of several of my teachers throughout the country. and, with luck, a passive solar greenhouse. If you tell me what you're most interested in learning, I'll include you in activities that are best suited for you. I try to adjust my tasks on the day my clients help out depending if they like active, physical work like mulching or slower, meditative tasks like seeding. In return for your work, you can choose between seedlings, produce, or a tutorial on something in particular you want to learn about. If you have specific skills that I'm in need of (such as repairs, construction, plumbing and mechanics) then I'll increase my end of the barter. These work exchanges often lead to paid opportunities. Contact me at gardens@wncmretc.com or 828.333.4151 and we'll discuss work times that are good for both of us. Something that I've heard frequently from 50-some-year-old farmers is how the unpredictable weather of the last decade has made farming difficult. I agree, and this realization actually further motivates my gardening activities. For I believe that as we directly experience the ramifications of strange weather patterns (and understand the human activities that influence inclement weather), we're more likely to adjust our lifestyles so we don't contribute to the Earth's imbalances. Instead we are invested in its healing. So I've added another reason to my growing list of why I garden: I become close to the cycles of nature. As unpredictable weather directly impacts me and my food supply, I feel the imbalances in the Earth, so I'm more likely to adjust my actions and activities to foster a healthy planet. Read more reasons on the M R Gardens website. Pick the kinds of herbs you need in whatever amounts you want at an affordable price. Perennial herbs such as oregano, thyme and rosemary should be ready by April, and basil and other herbs will be available in the summer.